We at Artwork Creations always enjoy a challenge with our framing, but let us flip the coin and pass the challenge back to you! 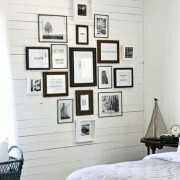 Why not freshen up your walls with a collection of family photographs, maybe in a diamond formation? You only need to start with a central column and then work your way outwards. It’s often a good idea to lay the pictures on the floor first and move them around until you have a pleasing design.